For covering incision area in all kind of surgery. Material: Iodine adhesive coated (45 GSM approx) PU film 15 micron thick with backing of 15 micron natural color PE film with siliconized release paper liner. 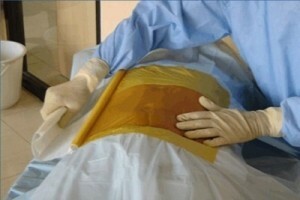 SURGIWEAR has developed IODOPHOR containing drape IO-DRAPE & IO-DRAPE-2. IO-DRAPE-2 is made of high moisture vapour transmission film. The moisture from skin escapes through this film. It is also very thin film. It conforms easily to the contours of body.